Sunday May 1st was International Barefoot Runners Day. There were 8 of us in attendance. One of the joys of having a large family is that we make a small gathering into a crowd! Our meetup was at Grays Lake Park just south of downtown. Forey, Andy, Milo (the littlest foot and go counter clockwise), Angela, Jaymon. EcoLips, Nuun, and Barefoot Ken Bob provided schwag for the event! We had fun running around on the grass before Forey and Andy arrived. It was chilly when not moving about. Archimedes raced anyone that would take his challenge! He and Milo made friends with another family playing in the park and the father of that gaggle said he runs in Vibrams Five Fingers. Crashing on the ground for a rest is much more fun in the sun. We were fortunate that the sun was shining even though it was chilly. Forey is a local icon having ran all of the Des Moines marathons barefoot as well as many other local races. In the above photo is Andy,in blue on the left. He came all the way from Cedar Rapids Iowa. Andy and I met on the Runners World Barefoot Running forum in June of 2009. My five year old spawn Milo ran with the guys for about a mile and a half. He kept up and sprinted with vigor when he thought someone was going to get ahead of him. His feet have had a great start and he barely breathes hard after a run. It was interesting to see the differences in our feet. Forey and Andy have wide thick feet and Jaymon and I have long skinny feet. I hung back with Jupiter and Archimedes while the other boys ran ahead. 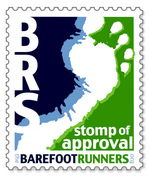 Next year I will do more for press releases as well as general advertisement now that I know that people need a bit more coaxing to come and check out what barefoot running is all about. Later in the day I went off on my own to get in some barefoot miles at the State Fairgrounds just up the road from our house. It was strange to run alone after having ran so long with Jaymon. The sun had warmed the ground nicely by 5:00 and stayed warm for the two hours I was out. Not to make any of you northerners jealous but isn't that sun gorgeous and look at that green grass! You know I am having fun when you see my forehead vein! I do have m BRS shirt on too but all you can see are the toes in this photo. Many textures to try out from street to rougher sidewalk, wood chips, grass, bricks, and sand. The hills and variation in the grade of hills at the fair grounds is one of the things I love about running there. This photo does not do this view justice but its lovely to see downtown in the lower left hand corner. The tulips waved goodbye in the wind as I drove home. 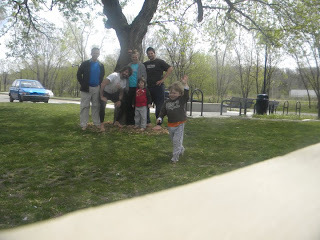 All around the inaugural International Barefoot Runners Day was a success here in Des Moines Iowa! Sounds like it was a lot of fun, love the picutres especially the one of the pink tulips, I'm sure there will be more people next year, once they begin to realise the benefits of bare foot running. That sounds like a beautiful day! Love how everyone got into the spirit of the day! What an awesome, awesome day! Your little guy is absolutely precious. Sounds like a spirited and fun day! I love that picture of you and your son... so cute! Temps hit mid-60s here in Minnesota... I enjoyed my run around Lake Nokomis immensely! I will make the 2.5 hour drive next year!! It's not that far from Omaha to Des Moines....I'm there! It sounds like a wonderful success, congratulations! Love the beautiful feet photos and tulips. Thanks for giving my day some color. May 1st - that's awesome - because I unintentionally ran 1.3 miles barefoot that day! Had to get somewhere fast and I had on flip flops, so I took them off and ran through grass and on sidewalk. It was so fun! 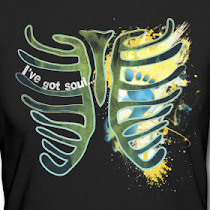 You feel weightless! I thought surely my feet would be shredded when I finished, but they were not! I can see why you love it. That is awesome! I'm a little jealous and disappointed that I have been unattached from this blog lately, otherwise I totally would have been there. Just started running barefoot about a month and a half ago. Live here in Des Moines as well. I've been getting more and more involved and hope to keep it up! So much joy in being barefoot... the way we were intended to be!